Flowers and Dots - 3 Sizes! Very pretty for creating an heirloom. This would be nice right under the neckline, yoke, bodice,collar, etc. You can use the normal 40 weight embroidery thread or the 50 weight DMC thread. The DMC gives a softer and nice Heirloom look. Very pretty for creating an heirloom. This would be nice right under the neckline, yoke, bodice,collar, etc. 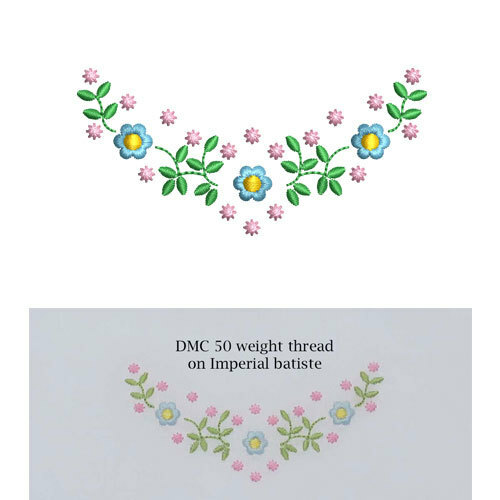 You can use the normal 40 weight embroidery thread or the 50 weight DMC thread. The DMC gives a softer and nice Heirloom look. Baby Wreath - 3 Sizes! Embroidery Cross - 2 Sizes! Finish Size 2.91" x 1.45"
Finish Size 3.28" x 1.58"
Finish Size 3.63" x 1.66"